I wanted to introduce you to a wonderful bold spice that is probably unfamiliar to some of you. This wonderfully flavoursome spice derives from the berry of a plant called ‘Rhus Coriaria’ that ranges from bright red to plum in colour and is grown wild throughout the Middle East and some parts of the Mediterranean. Whilst you can buy the berry whole, it is more often purchased dried coarsely or finely ground. The Romans used it as a souring agent as it has similarities to lemons in its tangy, tart taste. Whilst ambling around the spice market in Turkey this summer, I purchased some to last me for quite some time. However, like most things these days it is also available closer to home and can be purchased at most supermarkets or Middle Eastern food stores. So as to appreciate fully the qualities of the spice I thought a straightforward version of the ubiquitous Palestinian dish, Musakhan, would be a great place to start. The ingredients are simple and yet make a most appetising meal that can be enjoyed by all the family. It’s definitely a meal that you have to roll your sleeves up and get stuck in, so as to speak, and it requires you to eat it ideally with your fingers – far more satisfying. A number of the recipes for this dish talk about the sumac chicken and onions (and sometimes also allspice and saffron!) on a flat bread that then gets toasted and scattered with toasted pine nuts, but I thought I would create the dish in a wrap form to make it easier to pick up and eat. I leave it to you to consume in either the flat or rolled form, both will be equally delicious I assure you. 5. 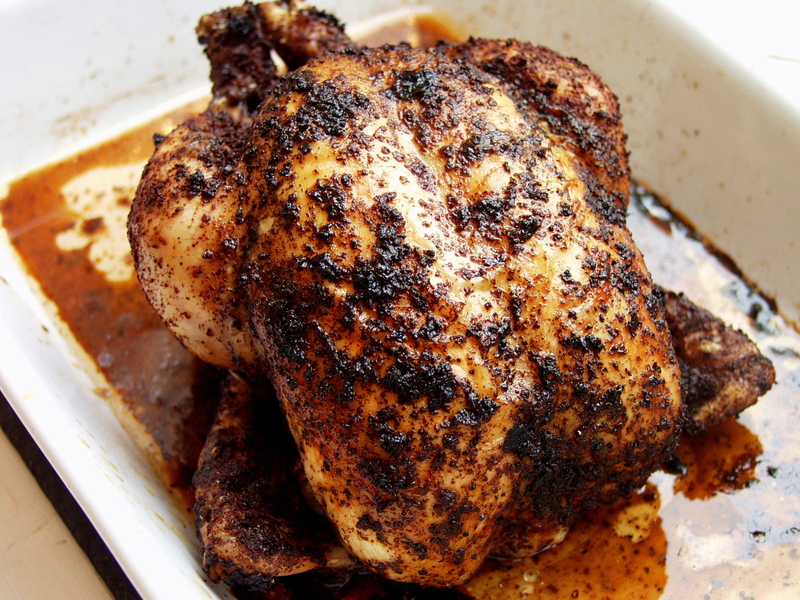 When the roast chicken is cooked leave to cool slightly and then shred the chicken, using a fork, from the carcass. There will be lots of juices from the chicken and sumac so place these into a dish with the shredded chicken. If you want to keep the remains of the carcass you could make this chicken soup. 6. 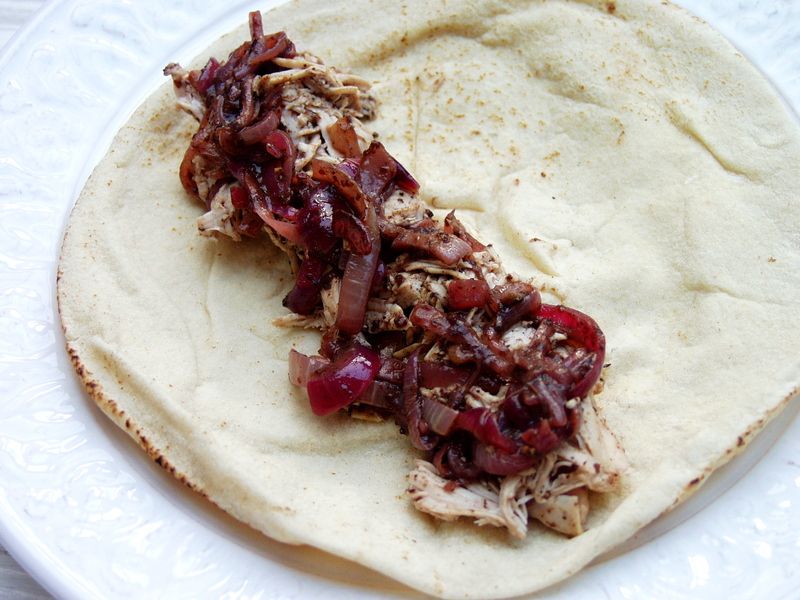 On the Middle Eastern flat breads place the shredded chicken, soft juicy onions and wrap tightly and place back into the oven for a couple of minutes to heat through. Then serve immediately with a quarter of lemon on the side. As an alternative you could serve the shredded chicken hot and warm up the flat breads and let your guests serve themselves and create their own wraps, in the same way that you would make your own duck spring roll! I served mine with a green salad which was full of olives, gherkins and tomatoes. A garlicky yoghurt or raita would also work exceptionally well. 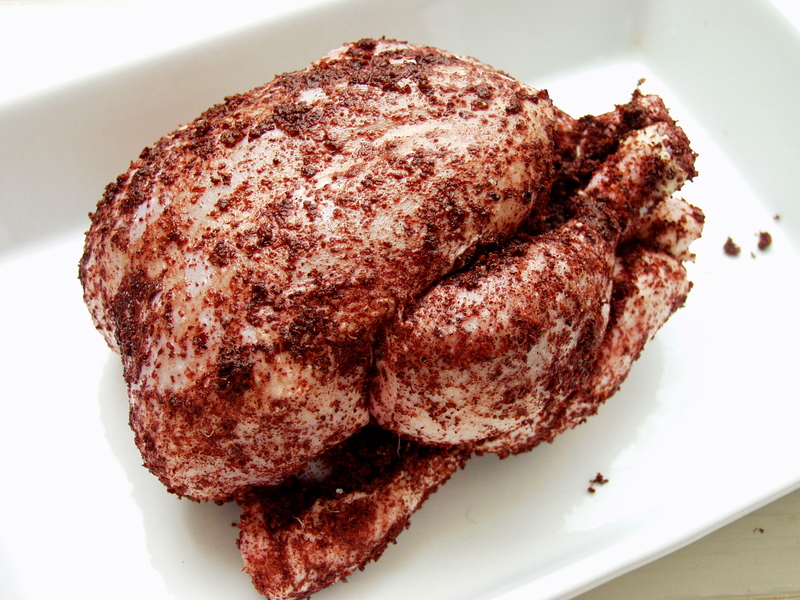 Smother the uncooked chicken with the sumac, olive oil, lemon, pepper and salt and leave to marinade for a couple of hours or if you are really well planned, overnight! I love the bright redness of the spice. 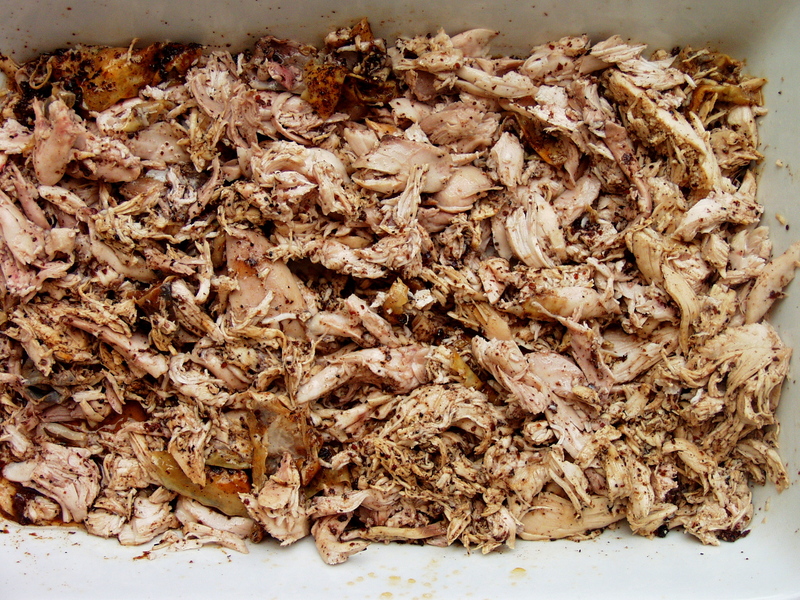 Shred the roasted chicken and mix it with all the juices that have come from the roasting. The taste is divine. Be careful not to overfill or you will find it hard to warp and then hold and eat. The finished product. 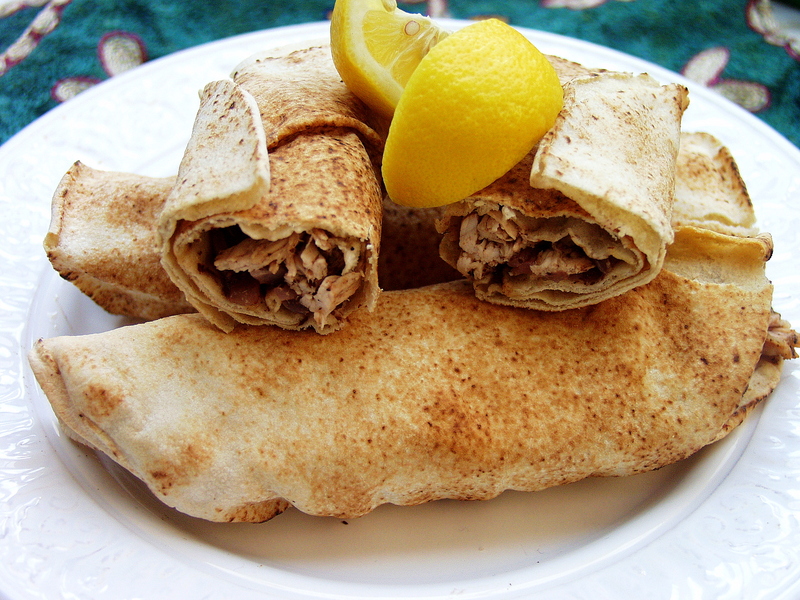 Roasted chicken with sumac, lemon and onion wrap. They are totally addictive and I assure you it is easy to polish off quite a few. 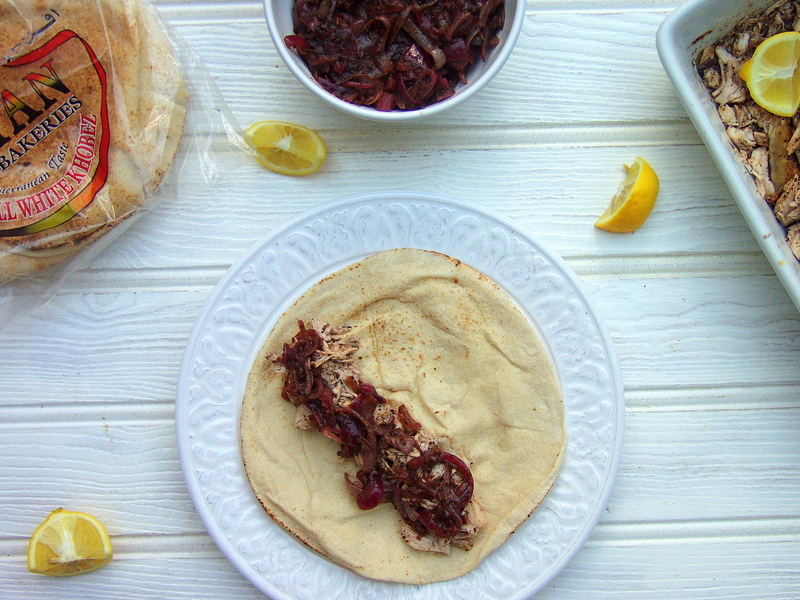 This entry was posted in Chicken and tagged chicken stock, flat bread, lemon, musakhan, onions, palestinian dish, roasted, sumac, whole chicken. Bookmark the permalink. I would love to try it, although best probably in the summer months!